Here at ChiIL Mama, we're quite excited for SYA's latest. As a mom of two teens currently in high school, the subject of bullying, particularly via social media is timely and topical. I'll be out for the press opening with my 16 year old son on February 17th, and I'm elated that my 14 year old daughter has the opportunity to not only come with her theatre class from Taft IB High School, but to read and study the script in school as well! She also had the chance to come to SYA's excellent production The Crucible with her school, so this will be an apropos production to follow. Chicago school kids are so lucky to have world class theatre opportunities at their doorstep and I'm grateful as a parent that our professional theatre community cares about nurturing the next generation. The public is welcome to book tickets for Friday and Saturday performances. Check back soon for my full review of The Burn. Public performances for The Burn are Saturday, February 17 at 3pm and 7:30pm; Friday, February 23 at 7:30pm; Saturday, February 24 at 3pm and 7:30pm; Friday, March 2 at 7:30pm; and Saturday, March 3 at 3pm and 7:30pm in the Upstairs Theatre. Steppenwolf for Young Adults (SYA) is proud to produce the world premiere of The Burn, written by acclaimed Chicago playwright Philip Dawkins and directed by Devon de Mayo. Featuring a cast of professional actors, The Burn addresses the bullying and social media issues that many teens experience in school. Public performances ($20) take place on Feb 17 at 3pm & 7:30pm; Feb 23 at 7:30pm; Feb 24 at 3pm & 7:30pm; March 2 at 7:30pm; March 3 at 3pm & 7:30pm. Weekday performances are reserved for school groups only. Tickets to public performances ($20; $15 with student I.D.) are available through Audience Services (1650 N Halsted St), 312-335-1650 and steppenwolf.org. Philip Dawkins is a Chicago playwright and educator. His play Charm, recently received its NY premiere at MCC in Fall 2017. His plays include The Happiest Place on Earth (Side Show Theatre/Greenhouse Theater Center); Le Switch (About Face Theatre, The Jungle), Charm (Northlight Theatre), Miss Marx: Or The Involuntary Side Effect of Living (Strawdog Theatre), The Homosexuals (About Face Theater) and the musical adaptation of Dr.Seuss’s The Sneetches with composer David Mallamud (Children’s Theater Company, Minneapolis). He teaches playwriting at Northwest University, Loyola University Chicago and through the Victory Gardens ACCESS Program. On March 10 at 3pm, Steppenwolf will offer its first-ever Relaxed/Sensory-Friendly Performance for The Burn. This performance is designed to be accessible for guests (and their companions!) who may include, but are not limited to, individuals on the autism spectrum, as well as those with sensory processing and/or integration sensitivities. Steppenwolf presents its inaugural Relaxed/Sensory-Friendly performance on Saturday, March 10 at 3pm for The Burn. Relaxed/Sensory-Friendly performances feature a more relaxed environment and minor adjustments to sensory effects such as lighting and sound cues. Tickets for the Relaxed/Sensory-Friendly performance go on sale on Friday, February14. For more information, please email access@steppenwolf.org. This performance is designed to be accessible for guests (and their companions!) who may include (but are not limited to) individuals on the autism spectrum, as well as those with sensory processing and/or integration sensitivities. SYA is partnering with the Storycatchers Theatre again this year to tour The Burn to three Juvenile Justice Facilities in Illinois. More details in the enclosed release. Following its four-week run at Steppenwolf and working in collaboration with Storycatchers Theatre, Steppenwolf for Young Adults will tour its production of The Burn for a week to three Juvenile Justice Facilities in Illinois. Storycatchers Theatre, winner of the 2013 National Arts and Humanities Youth Program Award, guides young people to transform their traumatic experiences into powerful musical theatre, developing the courage and vision to become leaders and mentors. By creating support for youth within the criminal justice system, Storycatchers prepares them to change their lives and emerge successfully from court involvement. Building on the success of last year’s collaboration with Storycatchers, during which Steppenwolf for Young Adults brought its production of Monster to three Juvenile Justice Facilities in Illinois, this tour will provide detained and incarcerated youth a chance to see the production and share their stories with professional artists involved with the play. In addition to the tour, Steppenwolf will host Storycatchers youth on the Steppenwolf stage in an original performance created in response to SYA’s production of The Burn, and featuring these incredible young people and their stories. This performance will take place immediately following the February 24 matinee performance. Audience members are welcome to stay for this performance. 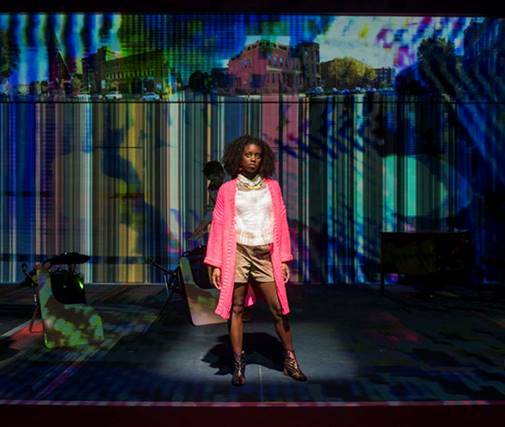 The Burn production team includes Courtney O’Neill (scenic design), Melissa Ng (costume design), Heather Sparling (lighting design), Sarah Ramos (sound design) and Rasean Davonte Johnson (projection design). Other credits include Hallie Gordon (artistic producer), JC Clementz (casting director) and Brian Maschka (stage manager). Hallie Gordon is the Artistic Director of Steppenwolf for Young Adults. The Burn cast features Birgundi Baker (Tara), Nina Ganet (Andi), Phoebe González (Mercedes), Erik Hellman (Erik) and Dyllan Rodrigues-Miller (Shauna). noon before Wednesday matinees. Limited street and lot parking are also available. For last minute questions and concerns, patrons can call the Steppenwolf Parking Hotline at 312.335.1774. Steppenwolf for Young Adults is provided by Allstate Insurance Company, Alphawood Foundation, Paul M. Angell Family Foundation, the Polk Bros. Foundation and United Airlines. Steppenwolf for Young Adults is also supported in part by contributions from The Crown Family, Lloyd A. Fry Foundation, Northern Trust Company, Field Foundation of Illinois, Dr. Scholl Foundation, the Helen Brach Foundation, ITW Foundation, Siragusa Foundation, Colonel Stanley R. McNeil Foundation, Citi Private Bank and Robert and Isabelle Bass Foundation, Inc; as well as Steppenwolf Associates, a community of dynamic young professionals. Steppenwolf Education is a citywide partner of the Chicago Public Schools (CPS) School Partner Program. Steppenwolf Education’s unique approach combines play production with educational components to enhance arts education for young audiences, as well as their teachers and families. Every season Steppenwolf for Young Adults (SYA) creates two full-scale professional productions specifically for teens. Working closely with the Chicago Public and metropolitan area schools and other community partners, Steppenwolf’s Education department annually ensures access to the theater for more than 15,000 participants from Chicago’s diverse communities. The initiative also includes post-show discussions with artists; classroom residencies led by Steppenwolf-trained teaching artists in almost 100 classrooms in public high schools; professional development workshops for educators; and the Young Adult Council, an innovative year-round after-school initiative that uniquely engages high school students in all areas of the theater’s operations, as well as other teen and community based programs. Steppenwolf Theatre Company is the nation’s premier ensemble theater. Formed by a collective of actors in 1976, the ensemble has grown to 49 members who represent a remarkable cross-section of actors, directors and playwrights. Thrilling and powerful productions from Balm in Gilead to August: Osage County—and accolades that include the National Medal of Arts and 12 Tony Awards—have made the theater legendary. Steppenwolf produces hundreds of performances and events annually in its three spaces: the 515-seat Downstairs Theatre, the 299-seat Upstairs Theatre and the 80-seat 1700 Theatre. Artistic programing includes a seven-play season; a two-play Steppenwolf for Young Adults season; Visiting Company engagements; and LookOut, a multi-genre performances series. Education initiatives include the nationally recognized work of Steppenwolf for Young Adults, which engages 15,000 participants annually from Chicago’s diverse communities; the esteemed School at Steppenwolf; and Professional Leadership Programs for arts administration training.